I'm a fairly regular camper. Growing up in southern Ohio afforded me plenty of open space and woodlands to explore the wild and in a small way disappear from society for a brief time. Now in southern California, I am a short drives distance from some of the greatest camping spots in the country. In our last venture to San Onofre State Park, a surfing camp spot, the location of the designated campgrounds was less nature and more urban, but certainly not less "wild". As we constructed temporary nomadic tent city I considered the view, to the west, native coastal plant life and beyond, the pacific. Directly behind to the east, not ten feet away were the parking spots and our cars, just behind the access road the amtrak tracks, and beyond that the 8-lane 405. 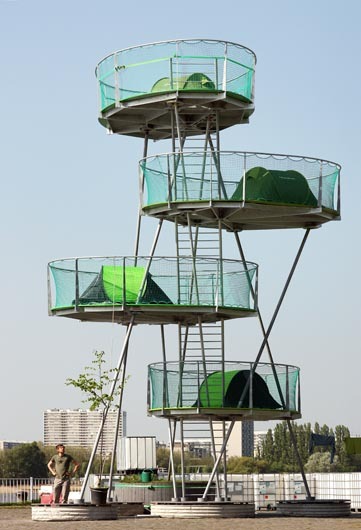 A less idyllic vision of the camping experience but I began to envision the future experiences of campers. As pockets of true wilderness that remain become few and far between, overcrowded and restricted access for their protection, the reason to visit these parks becomes muted. They become a place that no longer tests your manhood against the elements but acts as more as a museum for our ancestral frontiersman. But a new wilderness is developing. 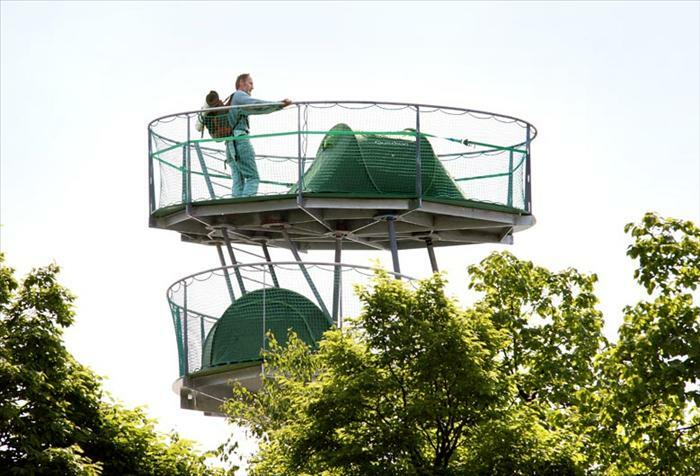 Cities are rapidly growing, becoming more complex, and rather then locking ourselves up in our protective boxes, what if we found a new way to to test ourselves in the throws of the urban wilderness? Rather then becoming intimately involved with nature, listening and understanding the landscape, we rediscover urbanity in a completely new way. Smells, sounds, people, paths, roads, parks, architecture all become things of exploration rather then simply parts of the sum. Perhaps a traveler from Sydney to New York could more quickly become familiar with the genus loci by submitting to its extreme exposure. 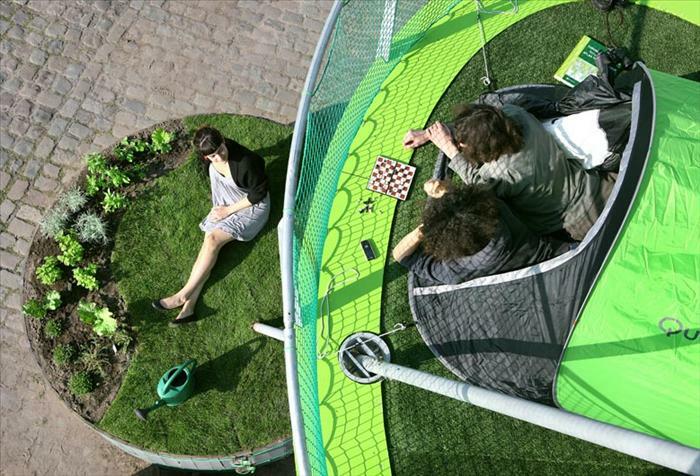 Import Export Architecten designed a new type of ‘small scale’ urban camping. 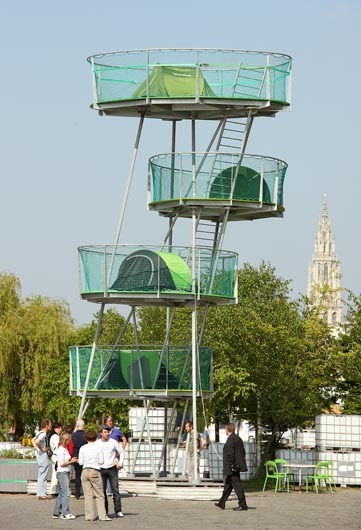 The mobile UC can be implanted in any city centre that likes to experiment with this new type of camping. UC is a place where adventurous city wanderers can stay overnight, meet other campers and find a safe shelter with basic designed practical facilities. Imagine some of the architectural visions of future Utopian cities, vast, and completely intertwined with giant swaths of green spaces. Forests, urban farms, and food providing plant life. Travelers could continuously explore the new urban wilderness, traveling from camping station to station, living off the land as they go. I also wonder, could this create a new breed of a nomadic culture, the homeless no longer homeless but joining a tribe of wanderlust vagabonds freed from the constraints of societal routine?